Trio of the Crown Lynn version of the Blue Band Cornish Ware design. 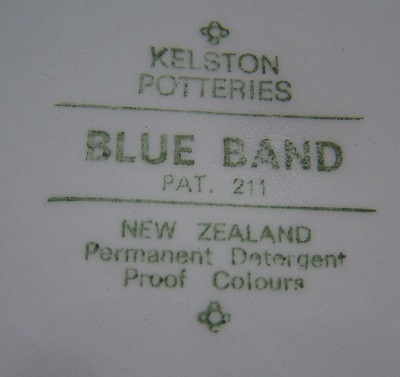 Plate is Back stamped Kelston Potteries Blue Band Pat 211.
fi sent this photo of Blue Band Pat No 211 and it doesn't look like it's on the Forma shape like Jonno's .....? I will check to see what shape it is. I saw a Blue Band saucer today in 805 shape (that had been paired with a tango blue 3019 cup) so maybe fi's plate is a coupe. 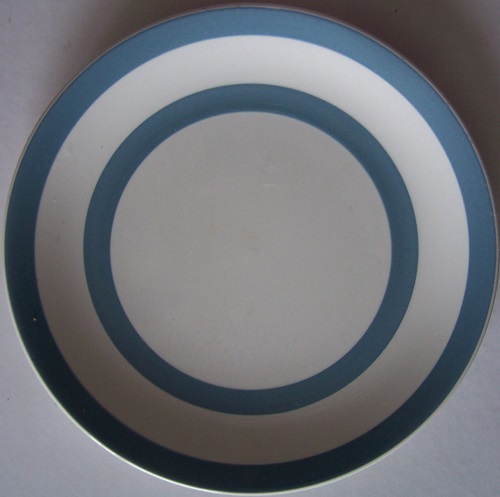 recently on TM there was a 3019 white cup with horizontal blue bands to look like Cornish ware, teamed up with the coupe shape. I think it would look less confusing if we change the image to Fi's one attached. Votes ... yay or Nah ? Janice I'm at work and can't think straight, but please do whatever you think is necessary to rectify this. I uploaded Blue Band 211 into the main gallery and moved Johnno's Forma cup stack into the no names - next to the blue rimmed saucer.